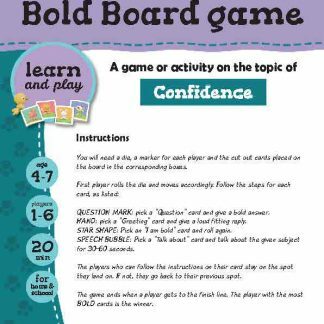 A game activity on the topic of Confidence. Time to play: 15 min. Acting is a great way for shy children to learn to practice a little more boldness. Separate the cards into 2 piles, one with the animals and the other with the actions. Place the piles face down in the middle of the table. Each player picks the first card from both decks and acts them out for the others to guess. The person who guesses the animal and the action is the next one to pick 2 cards and do likewise. Keep playing till everyone has had a few turns and all the cards are finished. There is no rush or competition, just loads of action and laughs.